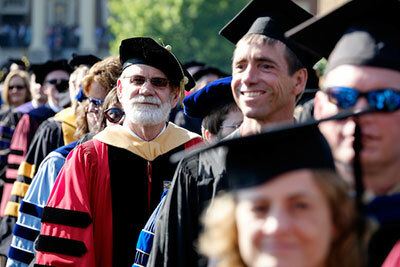 It’s Friday morning, Deac families. There were two main football events yesterday: the pregame tailgate, which believe me our students were going out for in force. 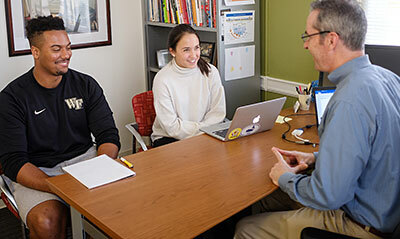 I have been meeting with my academic advisees to do spring course registration discussions, and there were a lot of texts and calls related to rendez-vous and supply-bringing to the tailgate area. 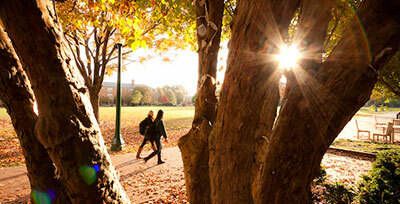 I have little doubt the tailgate was a success – it was a beautiful, warm, sunny day, almost 80. The second activity was the game itself, a rare Thursday night game, televised. That was less of a success. I believe the final score was Clemson 42, Deacs 13. At least we won the tailgate. In other campus news, I was walking on the Quad the other day and saw a big display of index cards taped up to the arch and wall nearest Kitchin residence hall and the Tri Delta sorority lounge. The cards were all filled with handwritten comments from women – self affirming statements about what they loved about themselves. 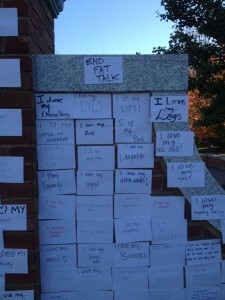 One of the cards at the top stated “END FAT TALK,” which I interpreted to mean that this wall was a place to place only positive affirmations, nothing negative. 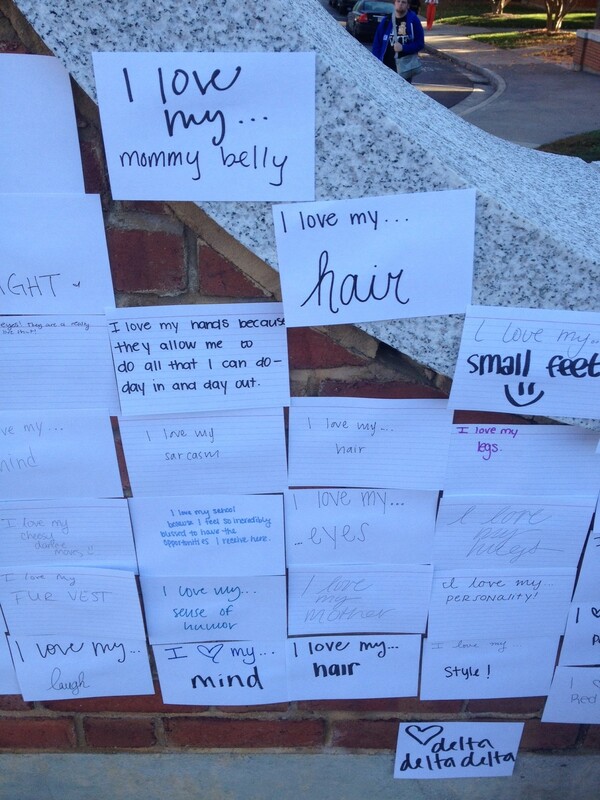 As a passerby to this wall, I have to say I felt so good and proud of these ladies for celebrating the things about themselves that they love, instead of turning all their attention to their perceived imperfections. When you can find reasons to be joyful about all that you are, it can help push away the anxiety or envy about all you are not. And let’s face it, none of us are perfect. The sooner we can all learn to understand who we are and accept it, like ourselves for ourselves, and not measure ourselves against some impossible ideal of beauty or intellect or wealth, the happier I think we will be. So kudos to Tri Delta if you were the group who pulled off such a nice exercise on campus. I have a message in to their organization to see if I can find out more about the project, and if I do, I will update here. 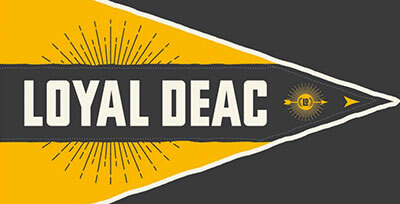 Happy Black and Gold Friday to all – have a great weekend, Deac families! “Tridelta does a national campaign every October called Fat Talk Free Week. The goal of the week is to stop what we call “fat talk”- things like “Does this dress make me look fat?,” “Stop it, you’re way skinnier than I am.” and even “You look great! Did you lose weight?” These comments force women to compare themselves to the skinny “ideal” and to others around them with completely different body types. 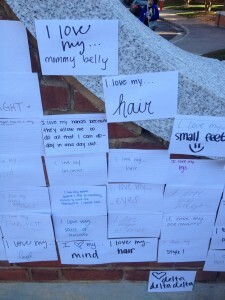 To do the wall, we just had a table with notecards that said “I love my…”, and we encouraged women to stop and fill them out as they walked by. A couple guys even stopped too! We really just wanted to show people how unique we all are and to offer people insight on things they may not have thought about before. For an example, someone wrote down “collarbones,” and I had never really considered what a cool body part that is!